Diana Jones has released seven albums in the last few years, most recently "Museum Of Appalachia Recordings", all of which show her excellent songwriting. Her Appalachian style singing and playing is a simple but highly effective musical style - it's primarily her singing and playing acoustic guitar, with some other instruments used quite subtly. This new album is as the name suggests, a live album. 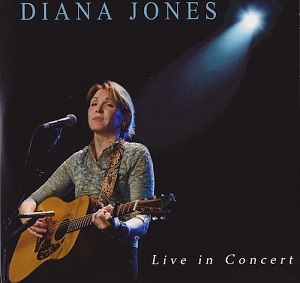 With many artists there would be a significant difference between their live and studio albums, but with some, like Diana Jones, there is very little difference. The last album, "Museum Of Appalachia Recordings" was basically recorded live, so it's no surprise that in concert Diana Jones is able to replicate the songs with ease. In fact without some of the short introductions and crowd applause you'd be hard pressed to differentiate this album from a one of her studio albums. The album was recorded at a number of venues across Europe, the UK and the US, including the Blue Highways festival in Utrecht in 2007, and the sound quality is great. Her songs really are well written and the simple musical style means you pay close attention to the lyrics and appreciate just how powerful the songs are. An excellent album that is highly recommended.